The Atlantic Beach Country Club is one of the only golf clubs in Cape Town that features a professional, comprehensive on-site Golf Training Academy. 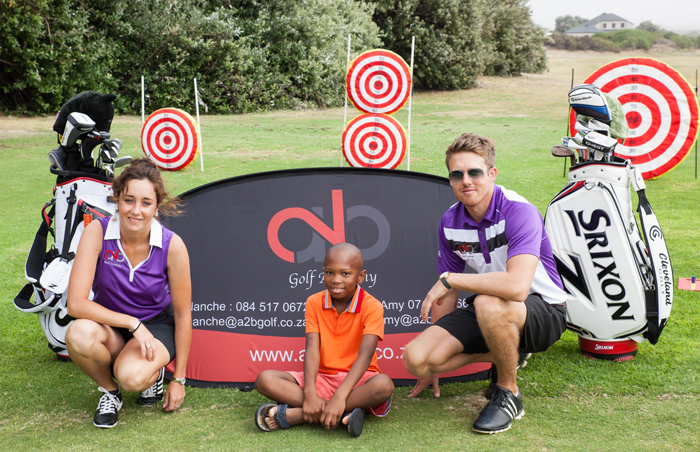 Whether you are new to golf and need to learn how to play, a seasoned golfer looking to improve your game, or if you are wanting to give your kids a head-start in golf, A2B Golf Academy has the professional skills and facilities to help you. Using state-of-the-art, world-class technologies, Amy and Blanche are able to provide an accurate and factual, rather than simply an opinion based view of your golfing abilities. Taking a holistic and personalised approach to golf tuition, Amy and Blanche then provide individualized guidance, which ensures that you as a golfer, can become your personal best. Instead of focusing on changing your golf swing, they work with your natural abilities to support you in becoming a skilled golfer in your own right. The Atlantic Beach Junior Golf Academy has developed a first touch program, aimed specifically for children in schools. Through incorporating years of experience, Amy and Blanche’s engaging lessons focus on short skills based games and activities, as well as key words and phrases, making the game of golf both fun and easy. Based on a personalised program, which Amy and Blanche will develop for your specific needs, we incorporate the use of our state-of-the-art technology, namely Flightscope, K-Vest and Golf Data to enhance your natural golfing ability. If you are looking for a more informal way to enhance your game, our leisure coaching days are the perfect choice. We host a Ladies Clinic every Wednesday, as well as other targeted clinics throughout the year. Amy Henning holds a BSc Business Management degree and has played high level, competitive golf for over 10 years. She currently holds the title for the Western Province Championships, was a member on the winning team at the Inter-Provincials in 2014 and remains a pro-golfer on the Ladies Sunshine Tour. Blanche Lamprecht is a qualified PGA Professional and a Sunshine Tour player for 6 years. He currently holds the title as the youngest golfer ever to have won the PGA National Championship and is also the only golfer to have won the National, Regional and Order of Merit Championship in a single year.